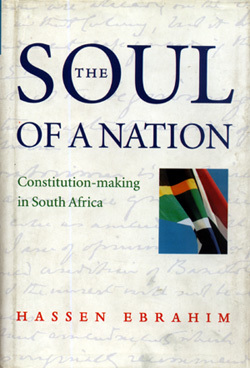 Serialisation of The Soul of a Nation - Constitution-Making in South Africa. We will Publish the entire book in the next two weeks. On 10 December 1996, the signatures on the country's new and final Constitution fixed a milestone beside the road of South African history, and marked the way for a new democratic order. The Constitution was also the birth certificate of the South African nation, a text adopted by an overwhelming 85 per cent of the Constitutional Assembly. This Constitution is one of the most advanced in the world, establishing a constitutional democracy in which a finely Grafted Bill of Rights enjoys pride of place. It divides government into national, provincial, and local spheres. In order to avoid the tensions and conflict inherent in this separation, a principle of co-operative governance was adopted, which obliges each sphere of government to co-operate for the greater good of the entire country. The Constitution makes provision for an independent and impartial judicial system including a powerful Constitutional Court. An entire chapter is devoted to the establishment of state institutions designed to support a constitutional democracy, and a representative, open, and accountable government is guaranteed. It also obliges the civil service to be broadly representative and to conduct itself in a transparent and accountable manner. In addition, all institutions of government must adhere to strict financial and accounting procedures. In short, the Constitution establishes a system of government that allows South Africa to become one of the world's leading democracies. This Constitution is the icon of South Africa's miracle, for it is the product of negotiations between political parties that were at war with each other not long before. It is also a political agreement between mandated leaders about what the most basic law in the land should be. In a sense, the Constitution represents a discovery of nationhood because it reflects the soul of the nation. A journey through the history of this negotiation reveals a uniquely South African characteristic: an obsession with consultation. South Africans tend to be suspicious of any process about which they have not been consulted, and as a result, the process tends to be as important as the substance of agreements. More time and energy was spent on negotiating the process of arriving at the final Constitution than on negotiating the substance of it. The most vigorous opposition, disruptions, and disturbances took place in support of demands relating to the process of drafting the Constitution, and were manifest even in high levels of political violence during the negotiations. The experience of constitution-making revealed another South African characteristic: the determination not to succumb in times of adversity. Despite their difficult circumstances, negotiators succeeded in finalizing one of the most advanced constitutions in the world with the greatest possible public participation. These negotiations also witnessed some of the finest leadership in South African history; for when political violence and civil strife seemed to threaten the prospect of peace and democracy most, parties were able to prove the prophets of doom wrong.